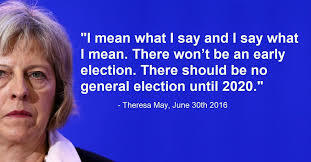 When the Prime Minister, Theresa May, announced her intention to call a general election last week, she said that the election was necessary because ‘the country is coming together on Brexit but Westminster is not.’ Anyone who thought about this for five minutes, concluded that the real reason May was calling the election, was to take advantage of Labour’s weakness and to shore up her position as Prime Minister and Tory Party leader. Today, we have some evidence to support this line of thinking. The Independent reports a YouGov poll which puts support and opposition to leaving the European Union (EU) neck and neck at 44% for each, which suggests the country is far from united on the issue. Split down the middle more like. Although the Tories and May as Prime Minister are well ahead in voting intentions at the moment, these polling figures suggest that the election may not be as comfortable as the government seems to think it will be. In an election that the government are trying to turn into effectively EU referendum 2, they have no lead amongst the public at large on the issue. This suggests that it is a dangerous strategy for the Tories to try to move the agenda onto this territory, rather than the usual ground at general elections of economic competence and tax and spending. This was reinforced by the Tories yesterday by giving no guarantees of not raising taxes after the election, at least not for the full Parliament. This is a highly unusual approach for the Tories to take. It is a rather curious approach for the Tories to neglect their strongest cards and instead fight an election on an issue where they do not hold a big lead. I guess, once May had decided to call the election, on the pretext of implementing the referendum result against hostile forces in Parliament, then logically the main issue had to be Brexit. May also probably thinks this will enable her to capture some Labour voting seats, where the people voted in favour of Brexit, but it is a strange tactic all the same. The Tories will no doubt bang on about chaos if they are not returned to government, Labour’s profligacy with the public purse and Corbyn’s stance on defence issues, but they run the risk of all of this being lost to the issue they themselves say the election is about. The key to all of this may well be Lib Dem voters, living in Labour held seats and Tory held constituencies where Labour is best placed to win the seat. Will they vote Labour? Surely they can see what the alternative will be, the hardest of Brexits and an unrestrained hard right Tory government. Not a happy prospect for anyone of a moderate disposition. I thought that Keir Starmer, Labour’s Brexit spokesman, made a decent speech today on Labour’s approach to the Brexit negotiations, offering a less risky exit from the EU, retaining single market access and remaining in the European Customs Union. The other opposition parties, Scottish National Party, Lib Dems, Plaid Cymru and Greens are all offering a softer Brexit, than the Tories, so there is some hope that May’s gamble could yet backfire. The problem for the opposition parties and all of those who oppose the government’s interpretation of how we leave the EU, is the spread of these votes, in our grossly unfair electoral system, first past the post, but it also offers an opportunity. The 48% who voted to remain, (indeed the 44% concerned about a hard Brexit in the YouGov poll), if they turn out and vote tactically, can at the very least, remove the Tory's current 12 seat majority. Whether this will be enough to form an alternative government, is uncertain, but if the government does lose its majority in Parliament, it is a complete game changer as far as Brexit is concerned. As living standards fall as rising prices outstrip near static wage rises as the election approaches, it may galvanise the opposition to the Tories, but it is more than just this. In this election, our values of tolerance, decency, fairness, respect and openness are under threat. A elective dictatorship, no less. Various campaigns have been formed to support this tactical voting endeavour, Compass, Open Britain, and the campaigner Gina Miller’s Best for Britain, so there is an effort to make all of this real. Although you have to make the Tories favourites to win the election and increase its majority, all is not lost. There could be a surprise outcome to this election, there is still hope if we act together.